If you want to create a little bit of noise online, start with Twitter and then become a movement. This is exactly what this non-profit did and the results are still echoing on their Twitter feed. It's the wonderful world of solicited exposure. Where in "real life", you'd think someone was off their rocker for following people?! Using social media has become second-nature in our day-to-day lives and even necessary for our personal one. How else will I remember a birthday of the girl who asked for my snacks in middle school? It's not so second nature in our work life though. Honestly, truly, we don't know how to be social as a professional on these platforms. We think --we should maintain the same demeanour at the office. We toss our personality to the side. ...And then wonder why we draw blanks when it's time to post something?! If you've ever felt this way about the internet, you're not alone. It's probably the real reason a lot of businesses hate the idea of social media --they don't understand it. But running away from something doesn't change the fact that, it's here -- in your face. It just makes you a scaredy cat. And you miss opportunities to show your passion and skill on a larger platform. These are some of the same fears WellFort CHS had. They were intimated by the online tools available to gain exposure. They knew the power of social media, they just didn't know, how to wield that power for good. Ultimately, for client retention and internet cred. WellFort CHS help clients see their health as an entire whole instead of a seasonal flu. WellFort focuses on preventing and managing illnesses under a holistic approach. Before we go any further, I have a confession to make. In 2014, about 3 years ago, I used to work at WellFort. First, as a Community Health Educator --then in my last year, as the Communications Coordinator of the centre. 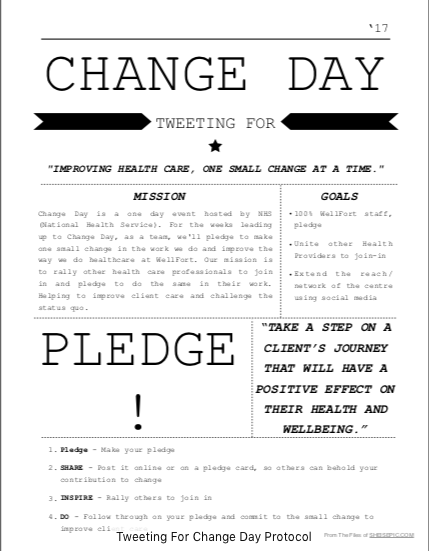 Before my contract ended, I planned, managed and executed alongside a team to bring Change Day to Ontario. It caught national media attention and we were featured on the Ontario Hospital Association website, putting a small town on the map. We definitely made some noise. So, WellFort wanted to duplicate that energy and commissioned me (from my own consulting & copywriting business) to work on the 2017 Campaign. Although they had the tools, there was zero know-how on executing a social media campaign. The end goal was to encourage staff to drive new initiatives & conversations on social media to connect with the community, year-after-year. Only one problemo...nobody had a clue on how to make this happen with less than a month before the online event kicked-off! First, educating staff on how to use these social media tools was crucial. Without the digital knowledge, any message WellFort put forth would fall flat, if not written for the specific platform. Learning how to shape their messaging via online helped them to push the Change Day initiative forward. Like they say in show biz, you have to frost the cake differently for different media outlets. a) An in-house staff training was arranged to get everyone on board, excited and prepared. After the training, a copy of the presentation material and video tutorial was provided as a reference for existing and new staff. Including, any troubleshooting support if things happened to go awry. b) Change Day had a lot of moving pieces and creating content for that one week, only to have it outdated by next year --was not the goal. So a Digital Strategy Protocol was written for WellFort to use as a guide and a template to execute a successful campaign, every time. What's fascinating about their story: the aim was to increase online engagement. As a result, they also increased offline client participation deepening their connections. They didn't know I was watching them from behind the scenes like a proud mama bear, manoeuvring Twitter like social media pros! And to think, it all started from a single Tweet. Would you have known they harnessed the power of Twitter in less than 24hrs? Need help establishing your digital footprint? I can train the team and write up your social media campaign. Book me here.